CONTRAFLOW, BY FAY MUSSELWHITE, rather took me by surprise. Something, not a meaning but more like a reverberation, is produced by the text over and above its apparent intent or capacity. Effects which should obstruct each other don’t, but work together as a singularity. What it amounts to is that the poems have a clear intent: descriptive, narrative, situational, which is generally straightforward and apparent; it is not concealed. Let’s call it the “story”. But they also have a wrought linguistic surface sometimes of some complexity which fails to obscure the story. We remain knowing where we are and what is happening while the linguistic medium twists and treks through a fairground of figures and glosses and verbal diversions which may derive from the story directly as metaphors, or indirectly as ornaments, or sometimes apparently not at all. There is an almost constant verbal play, a sporting and diversifying, which does nothing to hinder the direction of the plot, which reaches us unharmed through apertures in the textuality. It is as if, then, the poem’s message is an unproblematic and quite straightforward affair, in the telling of which the author delights in the opportunity to derive from it sensory (sonic, rhythmic) but also lexical values. The contraflow, then, is the work of language against the onrush of event or river (for it is a watery book). Fay Musselwhite wants to tell her stories without obscuring anything…the poeticised language is in service to this intent. The only poet I am reminded of is Dylan Thomas, whose “stories” generally amount to basic human somatic conditions upon which the text lays poetical surfaces the authenticities of which are the actual fruits of the poem. His stresses are quite different, especially the focal centrality of the first person, but in parallel to him I get the impression that Fay Musselwhite wants to tell her stories without obscuring anything, and that the poeticised language is in service to this intent. Furthermore that the poetical manner brings into the telling the strength of her own engagement with the substance of the stories, rather than referring her subjects to an elsewhere. 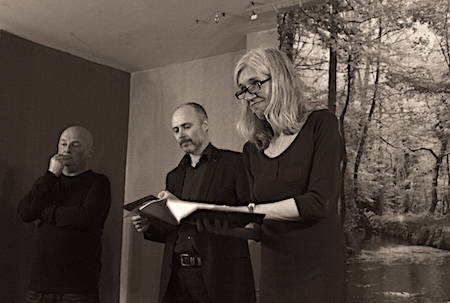 The scenario of the book is mainly urban backwoods, mainly of Sheffield – the spare ground behind the abattoir, the wrecks of 19th Century industry, those who camp in forgotten huts in the woods, the fourteenth floor of the living block, etcetera. The threats and desperation of these environments are taken on face to face, and there is a recurrent theme of a temptation drawing you away from that independent edge-land to bureaucratically sanctioned ease and boredom. In and out of this ambiance events, scenes, disasters, encounters with animals and others, are mildly or severely involved in her particular ways with language. Things generally speak for themselves. But at least twice in the book the habitual transformative poetical substance extends from marginal detail to the plot itself. In a short set called “Goat Boy and other Journeys” a number of people involved with animals in the urban edge zones tell their tales, one of whom is evidently a young man tempted by affection towards the city, who suddenly reveals that the sides of his forehead, under his bandana, still bear the scars where his horns used to be (deer horns, but he allows people to refer to him as Goat Boy). (Involved in the story is a taxidermist who does deer’s heads). This may make the story, considered literally, difficult, but it doesn’t affect the gist of the set at all. It introduces, maybe, a transient element of allegory, or shifts quickly into an imagined world and back again without disturbing anything. 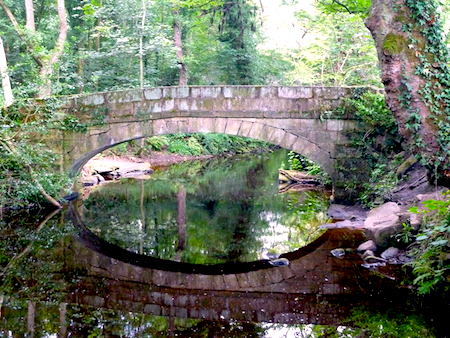 The biggest piece in the book, “Memoir of a Working River”, follows the physical and historical course of the River Rivelin, which runs from the moorlands towards central Sheffield. This is treated in a sequence of distinct poems moving from place to place and bearing senses of loss and continuity specific to the histories. But the river begins as an old man returning nostalgically to his “sleeping-bag days” at the river’s source and, lying on cold stone, “dreams” the rest of the set. In this he is the stream itself, then is not, hovers in and out of being the stream, and ends as the river escaping from its identity where it feeds into the River Loxley. The animation of the dream + geographical + historical river course, laden with burdens of age and the failure of industry, is expert, and holds some of her most extravagant but clear formulations. to the palm of the farm’s dappled yard. forgets the pacts they make. I believe that in Sheffield Ms Musselwhite is willing to lead small parties along the routes of her poems, stopping to supply information and read poems. There must be a devotion to the local which the poetical texture authenticates and extends objectively towards the public world. MATTHEW CLEGG’S THE NAVIGATORS is another watery book, this one in three sections concerning lakes (that is, the Lake District), canals, and sea-shore. There is an over-all directness to the writing and an educated resourcefulness, otherwise each section adopts a different writing position. The poems of the first sections are worked out of immediate experience of persons and place, in mostly small lines working towards a unity by precise locational detail set into a declared scene, with an occasional more far-fetched metaphor. Thus divers entering a deep lake are imagined “In morphine dark / their out-breaths / hatch / through dense / ferment / of drone.” More commonly the immediate terms of place and event are set out singly in short lines, a plain account in normal syntax cut up into a column of 2-3 syllabic bits, and if not that, everywhere the lay-out on the page is aerated, creating the tenuous calm of close attention. Abstracted summation is avoided in favour of telling image placement. The writing in this section is chastely focused, experience involved in the objects of the bionosphere, the self set back at a distance from subjectivising pressure. The “canals” section is rather different, though with some signs of the same careful particularity. It’s a collection of canal instances (the south Yorkshire canals, mostly either working historically or derelict) in language presenting no jolts or knots. All kinds of instances: working accidents, children swimming, canal as rubbish dump… There is a historical progression in the poetical forms starting with a few poems in a rough ballad-metre and/or dialect monologues, and ending with his own experience in the spaced-out forms of the first part of the book. Indeed as you turn though the pages of this section the poem lay-out gets progressively less solid. But nevertheless, what marks this section out is a normative sense of narrative and depiction throughout, without that kind of meticulous closeness of language and experience which disrupts the transmission; you would read these poems more quickly than those of the first section. The final section is an ambitious bid to unite the large-scale vision of part 2 with the personal and particular business of part 1, largely through the pressure of poetical extent. There are only five items and they are more substantial, bigger single poems, small sets of two or three poems and a sequence of twelve. The poems look more and more like solid blocks as you move through. There is no engagement with traditional forms, no rhyming or metrics, but the poems increasingly look like measured constructs and adopt a tone of secure continuity. The substance of the poems is personal romance, sea experience (and sea danger) and both together. The writing will not depart for a second from its set course, which is to bring larger and smaller forms of intellection together into one. Poems formed from classical texts are placed here and there in the book and very effectively catch up the watery business of the text into further reaches: Aristophanes in the middle of the first part, short sections of Homer inserted into the final sequence of douzaines (how to get the dead to speak, and how to ensnare Poseidon) and at the end Apollonius (the music of Orpheus which saves the ship). The reverberatory richness of these classical versions stands in contrast to the more familiar tone of the original poems, but suggests a reading alerted to wider possibilities in the careful handling of word-choice, spacing, and whole-poem tension. Publication: Wednesday, 17 May 2017, at 08:10.